Did you know that Plymouth in the South West of England is close to the birthplace of titanium - first discovered nearly 230 years ago? In 1790, in the heart of Cornwall in the United Kingdom, hobby geologist Rev. William Gregor found Manaccanite ore in a stream near the village Manaccan, after which the ore was named. Because of its strength, unique density and corrosion resistance, titanium has found applications in many industries. For high-quality tubing products, as example, it’s often a more suitable choice than competing materials like stainless steels or super alloys. The density of titanium is about 60 % that of steel- or nickel-based alloys giving significant weight savings in aerospace structures. Its tensile strength is better than that of austenitic or ferritic stainless steels. Titanium is exceptionally corrosion resistant and exceeds the resistance of stainless steels in most environments. The metal is non-magnetic as well and has good heat transfer properties, with a melting point higher than steel alloys. Titanium metal was first used as a material for military aerospace in the 1950’s. In the 1960s, its use expanded to commercial aerospace airframes and gas turbine engines. In the 1970s, non-aerospace applications began to develop, drawing on the material’s excellent corrosion resistance. These non-aerospace applications now account for about 50% of the worldwide titanium metal consumption. 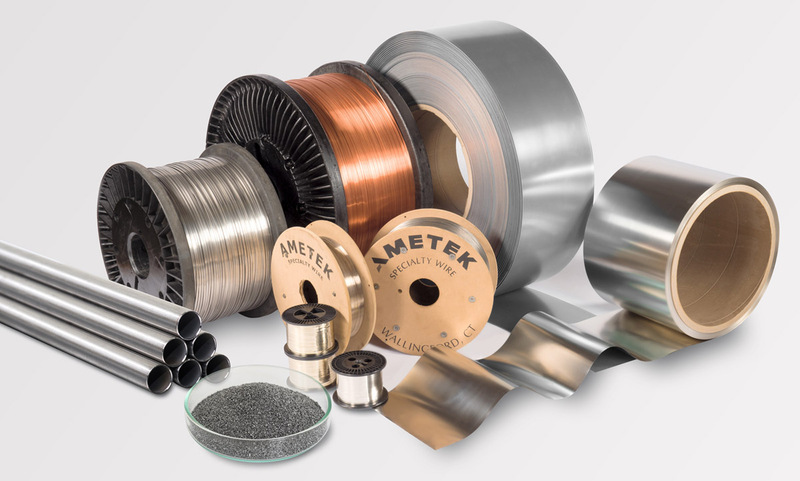 AMETEK Specialty Metal Products (SMP) is exhibiting at the Farnborough International Air-show this year, taking advantage of the opportunity to promote its capabilities in manufacturing specialty metal products in titanium for the most-critical aerospace applications. From high-purity powders and master alloys to high-precision strip, foil and wire, as well as high- performance metal tubes, SMP products are renowned worldwide for their outstanding quality and reliability. The four SMP brands, Fine Tubes, Hamilton Precision Metals, Reading Alloys and Superior Tube, will be represented at Farnborough in Hall 4, Booth 4024. Reading Alloys is regarded as one of the pioneers of the modern titanium industry. It was instrumental in the development of many of the alloys available today, including Ti 6A/4V. Its master alloys and powder coatings increasingly are used for the development and manufacture of next-generation aerospace components. UK-based Fine Tubes and its US-based sister company Superior Tube produce straight and seamless tubes in Ti CP, Grades 1 and 2, Grade 5 (Ti 6Al/4V) and Grade 9 (Ti 3Al/2.5V). Both companies are highly experienced in the conditioning, welding, machining, polishing and other processes required to convert a specific grade of titanium into a product that can deal with the most-challenging conditions. Fine Tubes, for example is among the few suppliers qualified to produce the high- pressure titanium tubes used in the hydraulic systems of the Airbus A380, designed to withstand pressures of up to 5,000 psi. Hamilton Precision Metals, as a specialty re-roller of metal strip, foil and ultra-thin foil, rolls .0001" to .0004" (.0025mm to .01mm) precision brazing foil in various titanium alloys for use in the production of jet engine fan blades and housings. In addition, AMETEK SMP in Wallingford, CT, manufactures specialty titanium wire for locking collars on aircraft.